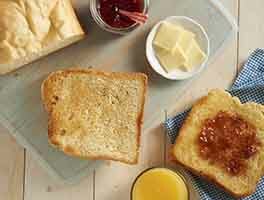 Here is one of our favorite single-loaf recipes for this pan. 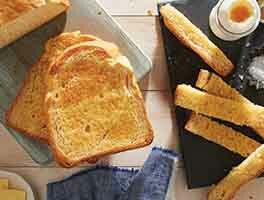 This light, fine-grained loaf makes great garlic bread... or delicious grilled cheese sandwiches! Try fontina, mozzarella, or a combination of Parmesan and mascarpone cheeses. Dipping a mozzarella, garlic and anchovy sandwich in (unsweetened) French toast batter before frying yields the traditional mozzarella en carrozza. Manual/Mixer Method: In a large mixing bowl, combine all of the dough ingredients, mixing till the dough begins to come away from the sides of the bowl. Knead the dough with an electric mixer for 2 minutes; allow it to rest for 15 minutes, then continue kneading it for an additional 5 to 7 minutes, or until it's smooth. Add additional water or flour if needed - the dough should be somewhat sticky. If you're kneading by hand, transfer the dough to a lightly oiled work surface; knead it for 3 minutes; allow it to rest for 15 minutes, then continue kneading till smooth, an additional 8 to 10 minutes. Transfer the dough to a lightly oiled bowl, cover the bowl with plastic wrap, and set it aside to rise for 1 hour; it should just about double in bulk. Bread Machine Method: Place all of the dough ingredients into the pan of your bread machine, program the machine for Manual or Dough, and press Start. About 10 minutes before the end of the final kneading cycle, adjust the consistency of the dough with additional flour or water; it should be smooth, though still a bit sticky. Allow the machine to complete its cycle. Lightly grease the bottom part of your covered baker and sprinkle it with cornmeal or semolina. Transfer the dough to a lightly greased work surface, and form it into a smooth, 13-inch log. Place the dough in the pan, cover the pan with its lid, and let the dough rise for 45 minutes to 1 hour. Check it occasionally to see where it's at; when ready to bake, it should have started to fill the pan side to side, and crowned about 1" over the rim. When it's risen as much as you like, take a very sharp serrated knife and make three diagonal, 1/2"-deep cuts in the loaf. Place the pan in a cold oven, and set the oven temperature to 425°F. Bake the bread for 30 minutes. Remove the lid from the pan, and bake an additional 5 to 10 minutes, or until the bread is golden brown and its interior temperature measures 190°F on an instant-read thermometer. The bread will bake for a total of about 35 to 40 minutes, starting in a cold oven. However, if your oven preheats slowly, you may find it necessary to allow the bread to bake an additional 10 minutes or so, beyond the suggested 5 to 10 minutes with the lid off. 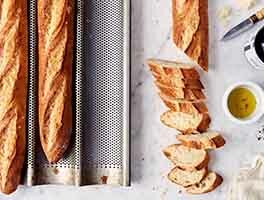 Remove the bread from the pan, and allow it to cool on a rack. Note: For the crispiest crust, turn the oven off, place the loaf on the middle oven rack, crack the oven door open a couple of inches, and allow the bread to cool in the oven. I have no idea why anybody would complain about this recipe. This was the most delicious Italian loaf I have ever made. It was super easy to make (and I made it two different ways). I used my bread machine to make one batch of dough and I used my KitchenAid to make another batch. They both came out delicious! I also didn't have one of your fancy schmancy baking containers so I used my trusty Italian Loaf Pan. They came out GREAT! I've baked this twice. The first time was disappointing, but today I paid closer attention to the directions and am very happy. Although I weighed everything, the dough seemed much too wet, but adding some more flour and kneading the full 7 minutes (with stand mixer) made a big difference. I baked it in a Dutch oven and the loaf came out pretty flat, but the crust was deliciously crispy, the texture is excellent, and the flavor ... I've eaten about half the loaf just by snacking on it. Makes a delicious sandwich loaf. I substituted some discarded sourdough starter for some of the flour and water and used much of the loaf to make a ham/cheddar/broccoli strata for Christmas morning. This is a very versatile loaf. This is possibly one of the best breads I've ever baked. I wanted something to serve with linguini and clam sauce, a favorite dish of my husband's that he was anticipating all day today. This bread did not disappoint. I followed the advice of Beth from PA (2/16/2018) and formed a round loaf on a circle of parchment and dropped it into my enamel cast-iron Dutch oven which I pre-heated at 425. I took the advice of another commenter and measured my flours in grams using my scale. I followed the Kitchen-Aid mixer directions to a tee, using my oven timer, and I only had to add about 1/4 cup extra flour. I let the dough rise in one of my dough rising buckets. It took a bit longer than an hour because I wanted to really be sure it had risen properly. This recipe makes a small amount of dough so I would advise really eyeballing it so you have a good idea of when it's actually 'doubled'. I baked this recipe in my lodge cast iron Dutch oven. Instead of a long roll, I shaped it into a round on parchment. I preheated the Dutch oven at 425, and after rising I plopped the dough on the parchment into the Dutch oven. Put the lid on and baked 20min. Removed lid and baked an additional 10 or so until the internal temp was 190. Made this recipe for the first time yesterday. It came out perfect ( I used the mixer to make the dough). 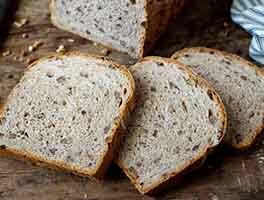 The taste is wonderful and this has been added to my list of very frequent bread to make. This bread tastes delicious. I noticed a lot of reviews with concerns about rising... If you're using active dry yeast instead of instant, you will need to begin with the yeast, warm water and sugar in the bowl first. Wait for that to foam (5 minutes) and then follow the recipe accordingly. You can use AP or bread flour to replace the semolina and half the water with milk instead of dry milk. Happy baking! I made this bread exactly as the recipe call for using the "Grams" measuring method. It turned out to be the best tasting bread I have ever made to go with some spaghetti I also made. It was absolutely the best. Can I use regular milk for the non-fat dry?